← Photo Taken of Bright Oblong Object (Light) in Early Morning Sky. PHOTO OF MARS TAKEN IN HELENA, MT 30 MINS BEFORE SUNRISE 7/22/2018. Description: A woman has been seeing a bright orange light hovering in south to southeast sky for the past five nights. The light is brighter than surrounding stars. When viewed through binoculars the light appears to have a dark center surrounded by orange lights. Additional Information Received From Witness: It looks completely different than any stars in the area and smaller than the moon, but not by a whole lot. When we zoomed in on it with binoculars what I saw very closely resembled the picture posted recently on your site in Iowa or Illinois I forget which? And it is very much in orange color like fire orange. We watched it move along the horizon. A few nights ago we could actually see clouds reflecting orange light around it so it was obvious that it was in our atmosphere. Note: The witness has been viewing the planet Mars which is very bright in the southern sky this month. Mars has brightness of -2.7. Venus is the brightest planet and sometimes reaches brightness magnitudes below -4.0. (Lower numbers indicate increasing brightness.) Also Mars is characteristically red or red-orange. 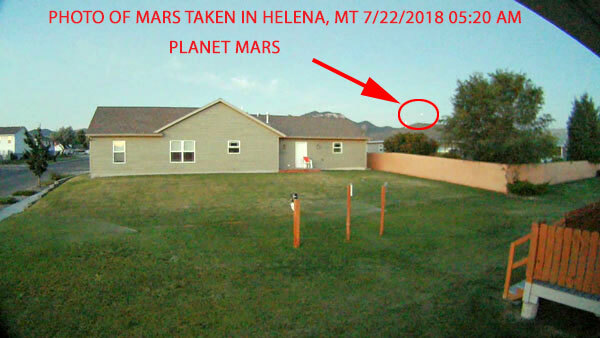 A photo taken by one of my security cameras in Helena, MT shows Mars. Mars was still visible about 30 minutes before sunrise on July 22, 2018. This entry was posted in bright light, Orb(s) of Light, Photos, Possible Planet, UFO Sightings 2018, UFO Sightings Washington and tagged Orange colored lights. Bookmark the permalink. 6 Responses to Bright Orange Light Hovers in Southern Sky Several Nights. At least Gayle’s paying attention to the skies! Yes, her and many others. I guess Mars is keeping people up at night! On July 22, 2018 at 2:15 AM I had the same sighting in the southern sky in SE WY. It was a bright orange light. Also saw a very bright orange light at.About 5:00 AM on July 21. It was low in the southwestern sky. With binoculars it looked like a burning orange light. This was seen from the Bitteroot Valley in Montana. I have never seen anything that bright. It appeared to be stationary. What was it?